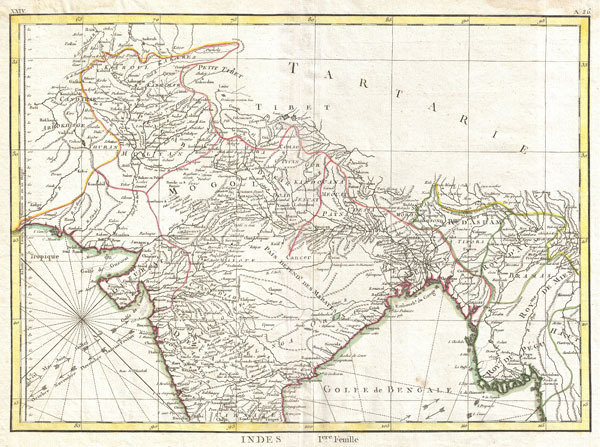 A beautiful example of Rigobert Bonne's 1770 decorative map of northern India. Covers the subcontinent from Kandahar east as far as Burma (Pegu) and south to just past Goa. Names countless important Indian cities, river systems and mines. Rhumb lines appear in nautical zones. Arrows in the lower left and lower right show the direction of prevailing winds during the dry season and the monsoon season. Drawn by R. Bonne in 1770 for issue as plate no. A 26 in Jean Lattre's 1776 issue of the Atlas Moderne. Rumsey 2612.053. Phillips (Atlases) 664. National Maritime Museum, 215.